Read any good books lately? I have! I love learning, stretching my mind, and staying up on the latest ideas so that I’m current and ready for anything my clients bring to the table. 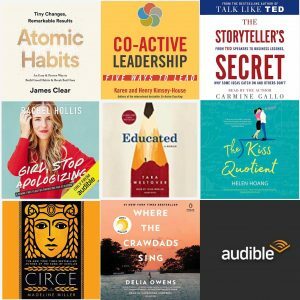 I listen to about a dozen books a month on Audible. Below are a few of my recent favorites. Atomic Habits: Tiny Changes, Remarkable Results by James Clear looked boring to me at first, but it wasn’t! It was surprisingly delightful! Clear reminds us that we are what we do. We become who we are by our habits. Want to be a healthy person? Make healthy choices over and over again. Want to be a creative person? Sit down and create on the regular. The book helped me gratefully acknowledge all the habits I have that make me a person I like to be. It also had me asking: what other tiny actions can do daily that will create big results in my life? 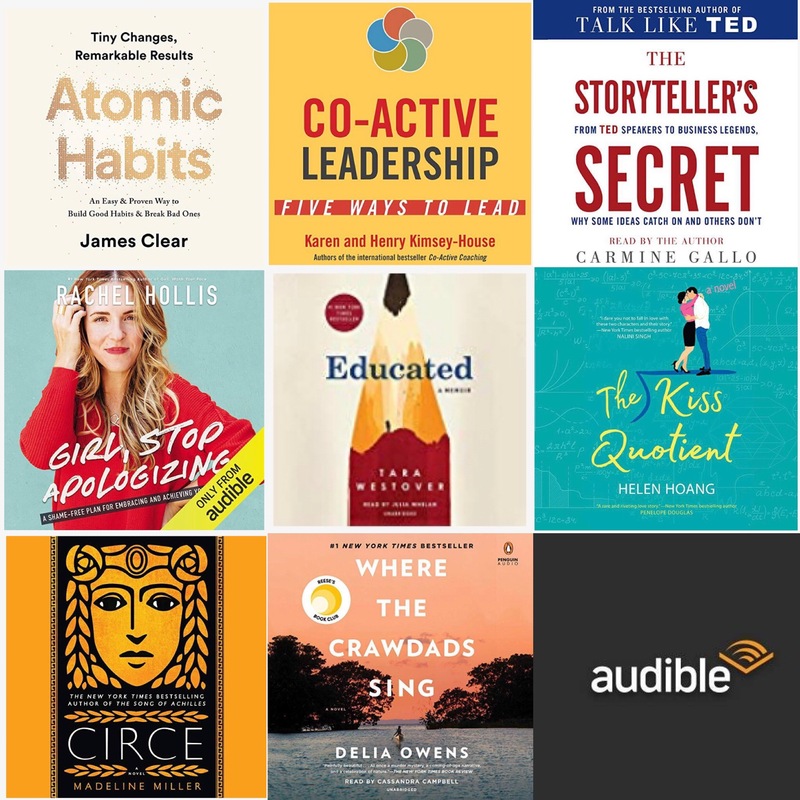 Co-Active Leadership: Five Ways to Lead by Karen Kimsey-House and Henry Kimsey-House is a short but power packed book that will remind you of the different ways you can show up as a leader in your world. You can lead from behind, from in front, from beside, from within and from the field. With super practical tips and examples in here. I’d say this is a good book for anyone who feels a bit of slump in their passion at work. Stop slumping, start leading. Your openness, kindness and shared humanity is at the heart of it all, and it’s good to be reminded of that. The Story-Tellers Secret: from TED speakers to Business Legends by Carmine Gallo is packed with stories! It’s a good book for people interested in inspiring new behaviors in the world. How do you change culture? Extend invitations to change? Market your business or product? Lead people to a new possibility? Get clear on what story you are telling, and tell it well. We all have a chance to tell stories. In fact, the way we tell stories shapes our lives in more ways than you might think. Do you recognize what story you are telling and living? This book will inspire you to frame your stories with more consciousness and power. Girl, Stop Apologizing by Rachel Hollis just came out this winter, and has a message I’d love to share with every woman I know. Ladies, for many reasons, we as women tend to think less of ourselves that we ought. We compare ourselves with others, we look to external sources for validation, we measure ourselves by some kind of crazy unattainable standards, and that only holds us back. As far as I’m concerned we can’t hear this message enough: you can do this, show up, learn what you need to learn, become the expert you can become, and don’t doubt yourself into oblivion. Educated by Tara Westover is a memoir about a woman who was raised in an authoritarian, survivalist Mormon family. From her teenage years, through college and adulthood, she disentangles herself from the thinking of her family to discover what’s true, what’s a lie, and what’s going to work for her. This book stuck with me for so many reasons – mostly I loved how she let us witness her unraveling and becoming. It’s messy and painful to reclaim your own inner knowing from any kind of brainwashing. It’s also courageous and inspiring. This is a diverse list, but maybe one of these titles sparks you. Giving yourself a good read is one way to feed yourself and to be well-rounded. If you try a book and don’t dig it, just return it and get another, but if you do like anything I’ve shared, I’d love to hear about it. P.S. Reading fiction is also good for the soul! If you’re down for a novel, my book club read and loved The Kiss Quotient by Helen Huang, Circe by Madeline Miller, and Where the Crawdad’s Sing by Delia Owen so far this year. This month we’re reading Exit West by Mohsin Hamid. Care to join us?